– Bouncing Castle, Cakes, Wheel Of Fortune, Toys, Plants, Bric-a-Brac, Books, Games, Barbeque, Crepes, Afternoon Tea, Raffles! 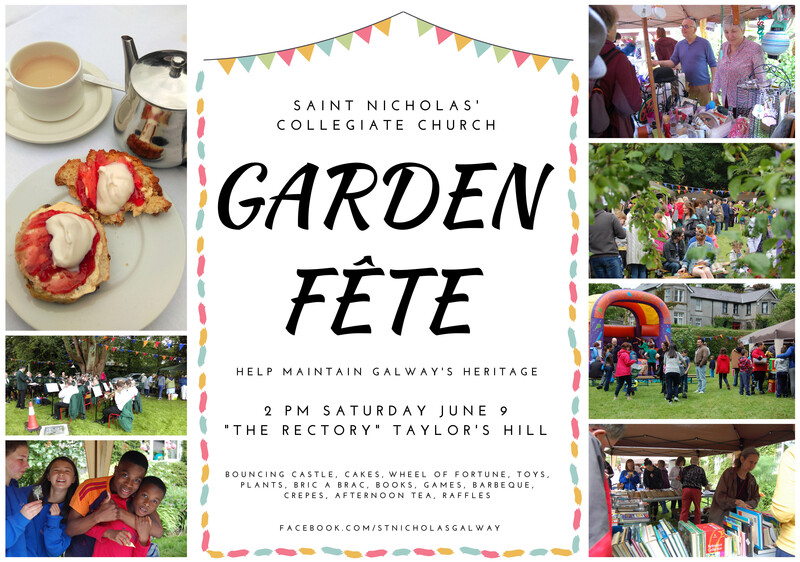 It’s that time of year again – the annual St. Nicholas’ Garden Fête takes place on June 9 from 2pm to 5pm at The Rectory on Taylor’s Hill. Everyone is invited to the fun-filled day, which has become one of the milestone social occasions in Galway life. As in previous years, parking will be available at St Mary’s College. All proceeds will go to maintain Galway’s fabulous mediaeval heritage church, St Nicholas’, in the heart of the city. A group of dedicated volunteers has been frantically busy getting the garden party ready — clipping hedges, mowing lawns, tweaking plants, baking all kinds of goodies for the bake stall, and preparing the barbecue. For the children, the bouncing castle is ready, in addition to the toy stall, face painting, ice cream, games, and myriad other activities. You can buy a gorgeous plant on the plant stall or get a bargain at bric-a-brac or the silent auction. You might even win a prize in the raffle, at the bottle and bag stall, or by taking a spin on the wheel of fortune. Afterwards, relax with a cream tea on the lawn, a burger or hot dog if that’s your choice, maybe a homemade crepe and chocolate sauce, or a lovely ice cream. St Patrick’s Brass Band is ready to play familiar melodies in their own inimitable style and the ambience will be just great. It will be a fun day out for everyone, young and old alike, and all money raised will help to maintain St Nicholas’, the oldest working building in Galway, soon to celebrate 700 years as a spiritual and cultural centre.